Seven men and a teenager have been convicted for their part in a revenge arson attack that killed four people. Shehnila Taufiq, 47, daughter Zainab, 19, and sons Bilal, 17, and Jamal, 15 died in a house fire in Leicester in the early hours of 13 September. Kemo Porter, 19, and Tristan Richards, 23, were found guilty of their murders. 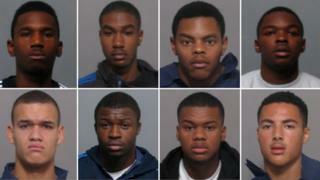 Shaun Carter, 24, Nathaniel Mullings, 19, Jackson Powell, 20, Aaron Webb, 20, Akeem Jeffers, 21 and Cairo Parker, 17, were found guilty of manslaughter. It is the first time Parker has been identified after the judge, Justice John Griffith Williams, lifted reporting restrictions. During the trial at Nottingham Crown Court, the jury heard the attack had been part of a "botched revenge attack". Prosecutor Richard Latham QC said the defendants had intended to target the house of another man who they believed had stabbed their friend Antoin Akpom. He said: "They simply got the wrong house - a tragedy." Image caption Prosecutors said the family's house had been targeted as part of a "retribution process"
The fire was started when petrol was poured through the letterbox and then lit. CCTV footage from the street on the night of the fire had been shown during the two-month trial. It showed eight figures walking towards the house and then three later running away. Giving evidence, the defendants, who are all from Leicester, said Richards had "terrified" them and had a "reputation". They said he had poured the petrol and started the fire using a lighter given to them by Porter. The other six defendants said they had not known of any plans to set fire to the house and claimed they had only intended to throw bricks at the property. The jury had found them not guilty of murder. The Taufiq family had moved to Leicester from Dublin to study theology. Dr Muhammad Taufiq Al Sattar described his wife and children as "four amazing human beings", whose goal had been to serve humanity. Media captionDr Taufiq Al Sattar: "Killing somebody is a crime and it should not happen, but I don't hate anybody"
"My beloved wife and three beautiful children, I can say they were really extraordinary people," he said. "They were very charitable. They had a strong concern for the welfare of others, even before their own comfort. "They had devoted their lives to a dream to give to others - the needy, the less privileged and the misguided. Four amazing human beings." Dr Taufiq said he had no hatred for the eight men convicted. "You hate crime. You don't hate individual people," he said. The paediatric neurosurgeon was working at a hospital in Dublin at the time of the fire. Det Supt Kate Meynall, of Leicestershire Police, said the defendants' actions on the night were "misguided and impulsive and obviously had tragic consequences". "Without exception they have lied from the start about their involvement, and they have continued to lie throughout the trial," she said. "None have ever taken any responsibility for their actions on that night, nor have they shown any remorse. "My thoughts are now with Dr Taufiq, who has lost his entire family and has to face the future without them. I can't even imagine how difficult this must be." All eight defendants will be sentenced on Wednesday.